Whether you need a new sign or repairs to an existing one, you can expect a great experience because we take pride in everything we do. Rely on our experienced full-service sign company to lead you through our array of signage options so you create a positive brand experience. 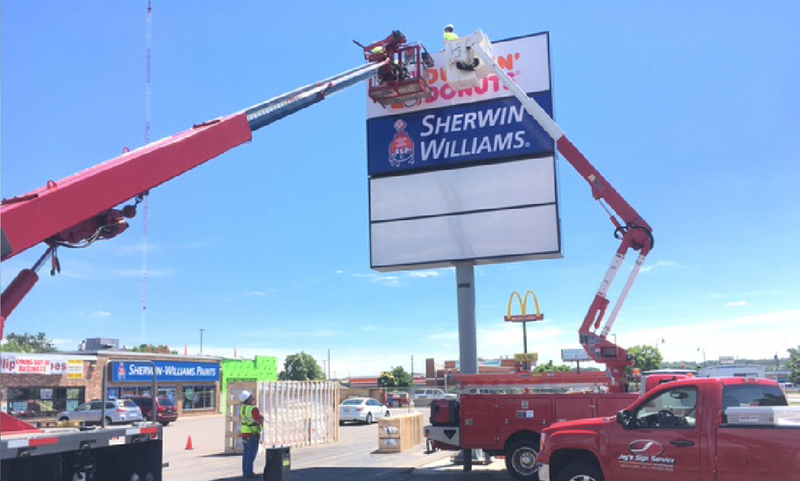 From custom, one-of-a-kind signs to large-scale sign projects for regional chains, our team can turn practically any sign imaginable into reality. Check out our portfolio. Vinyl signs, banners, and panel signs are made in-house by us. For more complex signs, we utilize a network of trusted leaders in the industry. We guarantee every sign we sell and install. Whether you purchased the sign from us or not, we can make the repairs or updates needed so it's always working for your business. Quality installation guaranted. We make sure the sign is well placed and will stand the test of time. We install or repair signs within a 60 mile radius of Eau Claire. Our clean and well-maintained equipment insures prompt service with no mess left behind. Our fleet of service vehicles can repair and install signs up to 60'. And we also construct footings for pole signs and parking lot light poles.